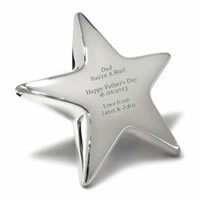 Engraving your gift on Business Gifts Express is free with no hidden costs. There may be a maximum inscription size (maximum number of characters) but this is ba sed on practical considerations such as space available and the need for inscriptions to be legible. Our team of experienced engravers use state of the art laser engraving machines to create a crisp, clear and very precise impression of your words into the base material. 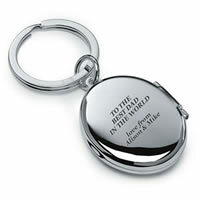 They can engrave into silver plated metal, nickel plated metal, crystal, acrylic and even leather. The size of your engraving on the product is usually determined by our engravers using their professional judgement, experience and expertise. It is very difficult to provide a preview of a specific engraved message because of issues such as the length of the message - larger messages may need a slightly smaller font - as well as spacing between lines, allowance for curvature of surfaces, and the exact placement. However, if you have specific requests for your engraving please contact us with details. The gallery below shows examples of some of our products with logo engraving. Please note, orders with a new logo upload cannot be placed with G.B. Courier delivery (next day), only U.K. Standard delivery (2 - 3 days delivery time). This is due to the additional time required to process a logo graphic prior to engraving. Orders with logo engraving that use a previously uploaded logo can be made using G.B Courier delivery, as the digitised logo is already on our system.